The layout of the Polyolefin Catalysis HTE Workflow of HTExplore is shown in Figure 1. For more details on the configuration of the Freeslate PPR48 (similar to the one already in use at LSP, with an additional tool to inject liquefied gases, e.g. propene) and Rapid GPC platforms click here. Figure 1. The HTExplore Polyolefin Catalysis HTE Workflow. Equipment listed in green is accessible via agreements with LSP; equipment in red is part of the HTExplore investment plan and temporarily accessible via Polymer Char. Full protocols have been implemented for the screening of molecular and heterogeneous olefin polymerization catalysts in the PPR. The processes that can be explored include solution, slurry and bulk propene polymerizations, as well as ethene homopolymerizations and ethene/1-alkene(/diene) copolymerizations in solution or slurry phase. The temperature and total pressure ranges are 40-200°C and 2-34 bar, respectively. The mini-reactor performance is fully comparable with high-quality conventional bench reactor setups, with a simple downscaling. 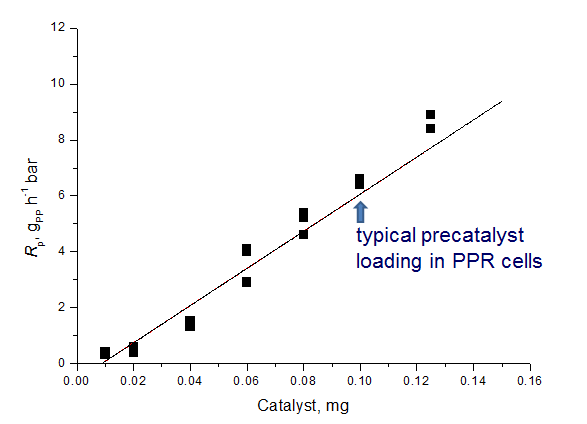 Minimum loadings of heterogeneous and homogeneous catalysts per PPR reaction cell, in particular, are 0.02 mg and 0.5 nmol, respectively; this ensures that highly active industrial catalysts can be screened in the setup with adequate reaction control. Representative results of test experiments of propene homopolymerization at 70°C in heptane slurry in the presence of an industrial MgCl2-supported Ziegler-Natta system are shown in Figures 2 and 3. Figure 2. Polymer yield as a function of catalyst loading (3 identical cells for each loading). Figure 3. 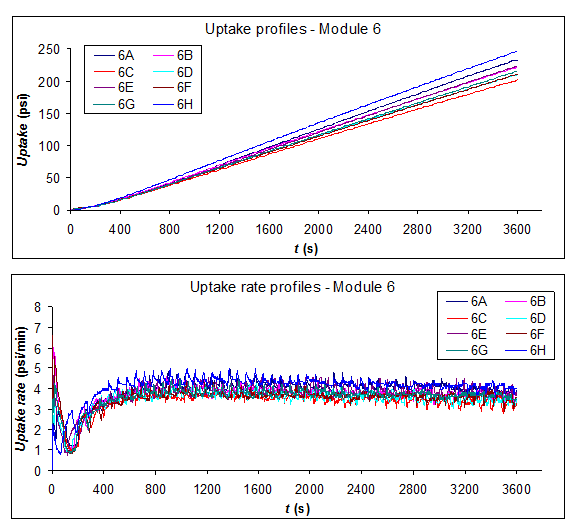 Monomer uptake and uptake rate as a function of reaction time for 8 identical propene polymerization experiments (1 PPR module). Running gas-phase experiments in the PPR is not practical. However, we observed that in most cases the results of slurry experiments closely approach gas-phase ones as far as polymer properties are concerned. Reaction yields are in the range of 100 to 400 mg per PPR cell, depending on polymer, process, and reaction time (which can span between 1 min and several hours). This is enough for the molecular characterizations listed in Figure 1, also considering that, based on experience, polymer samples obtained from duplicate experiments are identical within the experimental error. Typical 13C NMR and CEF traces for polypropylene samples produced with an industrial MgCl2-supported Ziegler-Natta system in heptane slurry at 70°C are shown in Figures 4 and 5. In both cases, the analysis time was 20 min, which corresponds to a throughput exceeding that of the PPR48 platform. Figure 4. 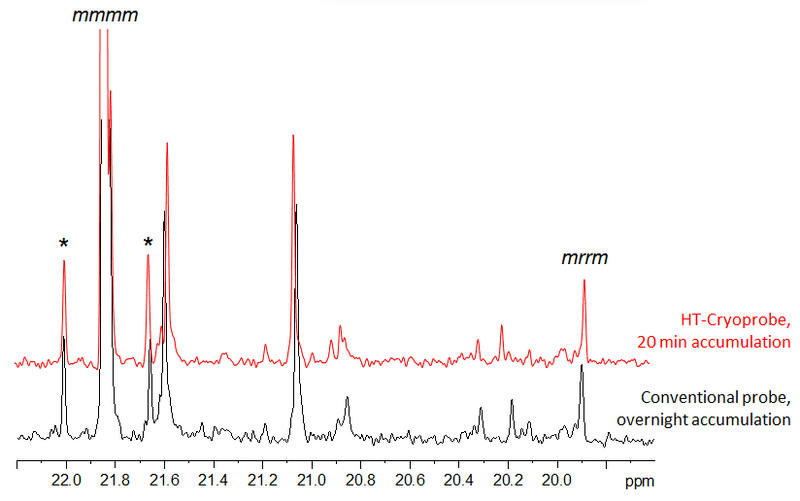 Methyl region of the 13C NMR spectrum of a polypropylene sample obtained in the set of experiments of Figure 3 (the two peaks marked with asterisks are the 13C satellites of the main isotactic pentad peak, and each of them amounts to ~0.5% of the total methyl integral). Figure 5. 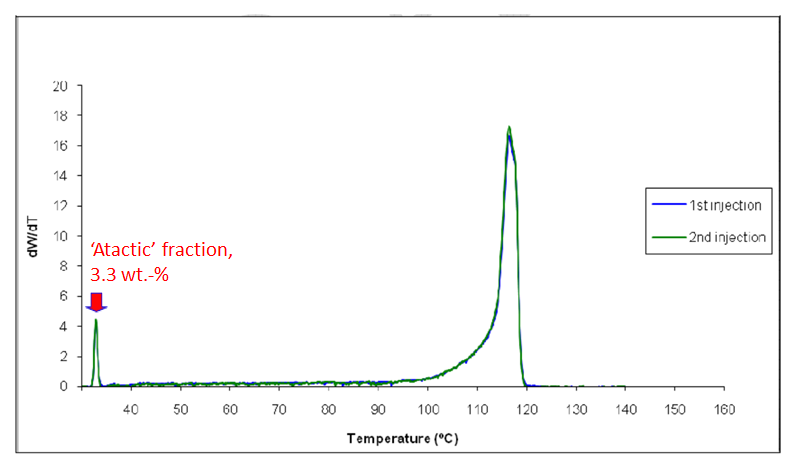 Crystallization Elution Fractionation (CEF) curves (in duplicate) of a polypropylene sample obtained in the set of experiments of Figure 3 (the small elution peak at low temperature arises from the so-called ‘atactic’ fraction, which can be precisely quantified to yield the Isotacticity Index, I.I. ).